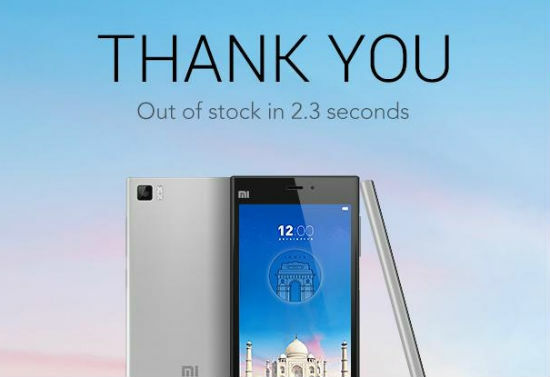 As claimed, Xiaomi Mi3’s fifth flash sale took place today at 2 PM via Flipkart and with the overwhelming response of consumers in the country, all the 20,000 units of stock were emptied in a mere 2.3 seconds. Hugo Barra, Xiaomi’s Vice President has taken it to Twitter this time to confirm that the 20,000 Mi3 units have been sold out in 2.3 seconds. While the Chinese vendor announced that it will be letting out only 20,000 units for sale in the fifth batch on August 19, they had received over 150,000 registrations. Unsurprisingly, this short time span is similar to the previous batches of sales that that have happened in the past. So far, Xiaomi has sold around 75,000 units of the handset via the e-commerce giant in these five batches of flash sales. The first sale of the Xiaomi Mi3 lasted for less than 40 minutes, but the consecutive sales lasted only for few seconds. It was also made clear by Barra that the firm underestimated the demand in India and apologized for the same. Following this flash sale, Xiaomi has announced that the registrations for the next batch of sale will be open at 6 PM today. If you are interested in grabbing the Xiaomi Mi3, do not forget to get yourself registered in order to be eligible to buy the handset in the next batch of sale. However, it is not assured that all the users who register will receive the handset as there will be only limited units for sale.